This is another great product in the Geaef slicer universal slicer range. The Graef E136DE2 Economy Slicer is a fantastic machine and is exactly what would work expect from a company like Graef as they are are known for their great design as well as high functionality products. The slicer exudes style and technical quality and will look superb on the work-top. It is an effective, safe and easy-to-use slicing machine and is ideal for slicing home made bread, meat and vegetables. 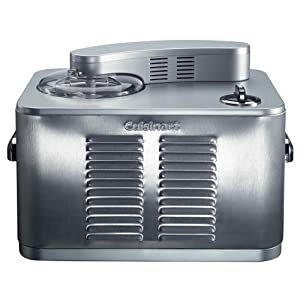 Delight family and friends with delicious gourmet ice cream, refreshing sorbets and sumptuous frozen yogurt simply with the Cuisinart Ice Cream Professional. Add seasonal fruits, grated chocolate, chopped nuts and more through the opening of the transparent lid at any time during churning. With the touch of a button, this stunning brushed stainless dessert maker automatically starts the process, just add the ingredients to the mixing bowl, set the timer and prepare to indulge. The Cuisinart Ice Cream Professional is extremely easy to use. The professional compressor system means there is no need to pre-freeze the bowl, creating 1.5L of delicious, fresh ice cream, frozen yoghurt or refreshing sorbet in just 35-60 minutes. Fully automatic, simply add your choice of fresh ingredients and switch on. The open window allows ingredients to be added during mixing, such as fresh fruit or chocolate chips. When the cycle is complete, the ice cream maker will turn itself off and sound an audible beep to let you know your dessert is ready. The stunning white And Stainless Steel Bosch Styline Collection Kettle is excellent and has four temperature control Settings so you can boil your water to the desired temperature and makes an audible sound when it has boiled. The kettle can boil water to the following temperatures 70, 80, 90 or 100 degrees, and also comes with a function to keep the water to temperature once boiled. 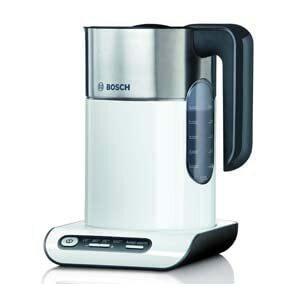 The kettle is also able to boil a single cup of water. The kettle feels very solid and is built to a very high standard. The lid is well designed and is built to last, everything about this kettle is well thought out and well designed. All in all The Bosch Styline is good to look at, easy to use, very quiet and has a very fast boil. If you need a kettle and don't mind paying that little extra then we would recommend this one!